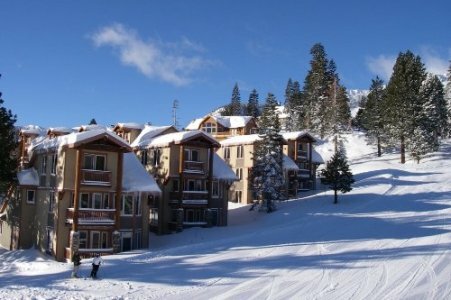 Included below are ski-in / ski-out condos for sale in Mammoth Lakes, CA, updated daily from the Mammoth Lakes MLS. The Juniper Springs Resort area is located at the base of Eagle Express and home of the future “Eagle Lodge”. The area offers easy access to the slopes with ski-in, ski-out access from Eagle Run condos for sale, Sunstone condos for sale and Juniper Springs Lodge condos for sale. The Bridges condos for sale are located on the “Bridges” ski run above Eagle Express (formerly "chair 15"), and higher yet is the Altis luxury townhomes development, consisting of four modern units with floor to ceiling windows to capture the down valley views towards Crowley Lake. The Juniper Crest luxury townhomes for sale, behind Juniper Springs Lodge, offer groomed access to the ski slopes, spectacular views, large floor plans with private Jacuzzis and attached private garages. Bridges condos for sale with some homes offering ski-in, ski-out access. Both of these multi-Million dollar neighborhoods consist of large custom homes, many with bluff views offering spectacular panoramic mountain and lake views. The Juniper Springs resort area is a great year-round destination offering a wide variety of real estate options to suit every preference and budget.